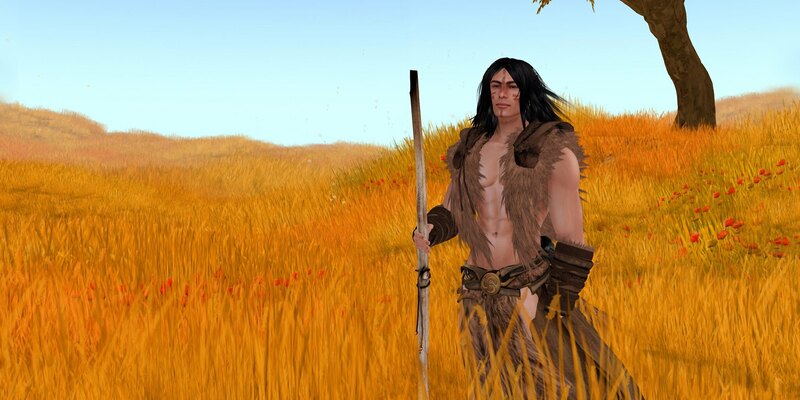 Naman had spent most of his life in the peace of the wilds, living side by side with the beasts of the forests and the many other gentle creatures in the wild lands of the Mysts. Magical forces were always at work, as was Naman. He served the the light of creation, the most gentle of all guardians of the realms of the living, exerting what gentle influence he could to protect and preserve the wild lands. The day came when darkness fell. A dark magic was at work and revealed itself as it began to tear the world to shreds. Cities, castles, mountains and rivers were torn apart and lifted away as a gust of wind would displace a spot of dust of a flimsy leaf. It no longer mattered what had caused this cataclysmic event. It only mattered that Naman needed to leave. He could see whirlwinds of trees, earth and stones in the distance as the world around him was being blown into oblivion. Creatures scattered about, attempting to flee the unseen destructive force that was tearing the world apart. Fauns and satyrs ran by in a panic. What sounded like the far away battle cries of orcs became silence as he saw the encampment in the distance torn apart and swallowed by a torrent of shadows and smoke. Dragons were flying and disappearing into the clouds above. He imagined them using whatever natural magics they had at their disposal to leave the realm. This world was doomed. It was time for Naman to take his leave. The time for preparation had long since passed. There was no time for long winded spells or incantations. A portal was needed immediately. Blood magic was not the shaman's preference, but the lack of options was evident. He reached into his pouch and pulled out the amethyst shard. He locked his gaze to the shard as he reached for a small blade hanging from his hip. He took some solace in knowing such small amethyst shard could unlock the immeasurable power he needed to escape this dying world. As he ran the blade along his palm he imagined the center of the shard. He could already feel a piece of his soul entering the shard before the first drop of blood touched it, connecting his life force to it. Beams of purple and violet light would escape the shard, glowing and pulsating as they formed the portal to which his life force was now connected. More dragons passed over him. He would catch a glimpse of the most majestic looking one, violet in color. It dove through the clouds in a push against the unfathomable winds of destruction that were tearing the surrounding mountain ranges to pieces. The shard flickered in his hand as ribbons of light began to spiral upwards, reaching towards the dragon. Naman hoped whatever magic the dragon held would not interfere with his escape. The dragon flew farther and farther away as it unknowingly siphoned off the shard's energy until the shard itself evaporated in his hand along with the life force of his soul. A feeling of dread, unlike any he had felt in years passed over him. The portal remained, but his soul and his life force were shattered. Their missing essence gone with the dragon. Time had run out. He brought his attention to the portal before him and began to step through it. Once journey had ended and another one had begun. He would search for the amethyst dragon, the majestic creature that unwittingly carried off with the most valuable of treasures. He would need to find it and reclaim his life force and soul.